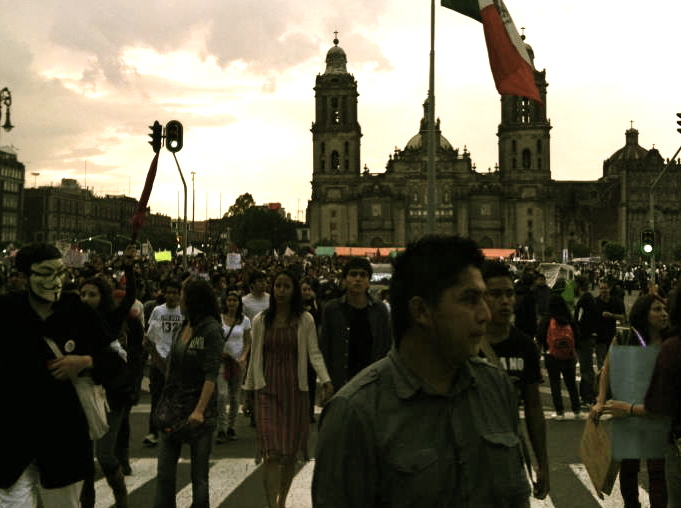 El Zócalo es un sitio de encuentros y de choque, de contemplación y manifestación. De grandeza: grandeur. I’m sitting in the heart of México, leaning against the enormous flag pole that hoists the tricolor flag adored and honored by millions. This is my favorite point, in my favorite Colonia, of the city. 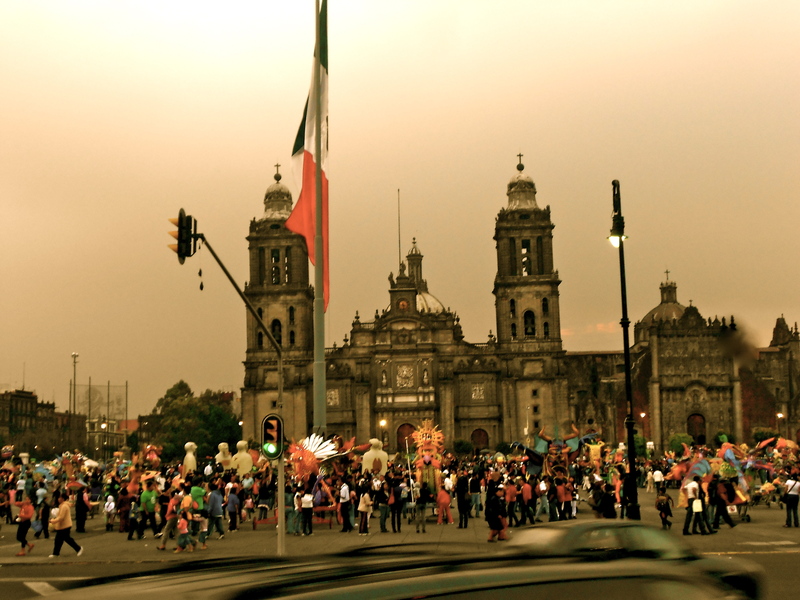 This is a place of constant movement; with every national holiday and change of season, el Zócalo is transformed. Giant ice rinks, a capitalisticly branded christmas tree, el grito and independence day, revolution commemorations and the international book fairs are some of the events that require the perpetual rearrangement of this sacred space; constant mutilation, sometimes in the interest of official city ordinance, capital accumulation or for the diffusion of national and international culture and art. Usually, these spaces require bureaucratic planning and government approval. However, there are rituals and performances of a more organic, angry, desperate and sporadic fashion: mass protest and social grievance manifested. This is a sacred site for the left in Mexico, a symbolic and spiritual plaza that is usually the end point of many marches that paralyze the city. Students have claimed it, Zapatistas, electricians, families of persons disappeared in the appalling mess of a “War on Drugs”, and Lopez Obrador have claimed it. It’s volcanic stone square adorned floor bears signs of its constant use and the weight of millions that have walked, marched and danced across it. There’s discernable trash and disarticulated paper kites, paper bags and condoms, pan dulce crumbs strewn across the square. The bubbles that float atop it reflect along its beautiful 360 surface of water and soap particles, the panorama of La Caterderal, el Palacio Nacional and the light blue and grey sky. Today I hear the beat of two conga drums and the musings of street performers. Just beyond the demarcated square, there sits a young man playing a spanish guitar and beside me there sits a couple with their Sunday afternoon purchases of black and white glossy photos of early 20th century Mexico. And if I look directly above me, the impressively long flag pole rises and reaches for a spectacular horizon and the bluest point of the rarely blue Mexico City sky. 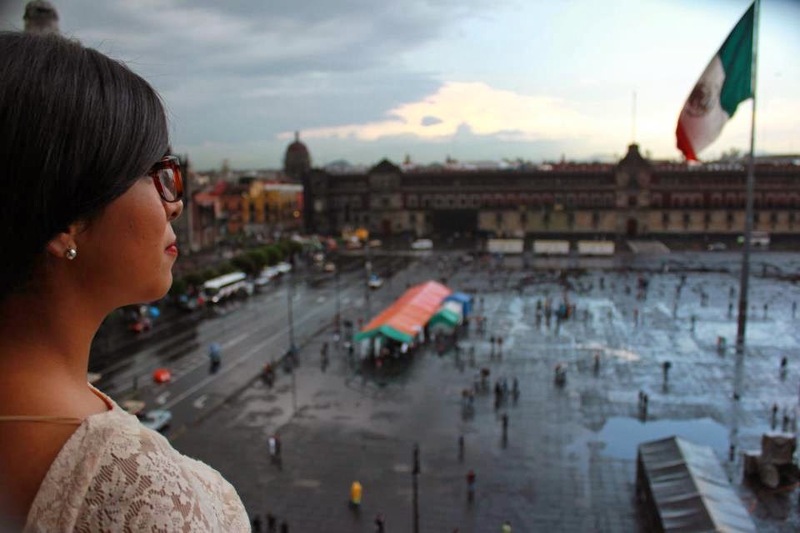 The largest plaza in a country of a thousand plazas, el Zócalo feels sacred. Enduring and eternal, there is no weight that can ever undermine its millennial importance and strength.